On March 18, 1910, the first film adaptation of Mary Shelley's Frankenstein was released by Thomas Edison Studios. 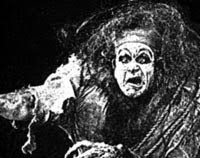 A silent film considered too scary in its day, the twelve-minute film was thought to be lost until a print was discovered in the seventies. Now it's available online through the wonders of YouTube. The only thing that would make this film better is if it had used some funky steampunk technology. Click here to check it out. That is an amazing piece of film-making history. The scene where the creature is coming to life, even though it's obviously in reverse, is surprisingly chilling.